Keep a list of any concerns you have. Bring the list with you so you remember to discuss these concerns during your visit. Record any symptoms your child may be having. All symptoms are important when talking about health issues. Involve your child in the visit – before and during. Talk to them about it before you go so they know what to expect. If they are old enough, ask them to tell you and the doctor how they are feeling. Whenever possible, schedule visits at a time that your child isn’t usually napping. Use a toy doctor’s kit to teach your young child about all the things the doctor will do when you visit. Or bring along a favourite “buddy,” a stuffed animal or doll who gets an exam along with your child. This might help your child feel more comfortable when it comes time for the real thing. Young children may find it difficult to sit still in a doctor’s waiting room. Bring a couple of books, a favourite toy and a snack to help keep your child busy and happy while you wait to see the doctor. If your child is older, explain why they are visiting the doctor. Use simple, easy-to-understand language. If your visit is for a regular check-up, explain that all children see a doctor, and that the doctor will check how they are growing and developing. Be honest about what your child can expect from the exam. 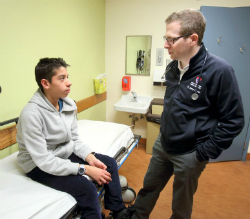 Tell your older child or teenager that they can see the doctor without you in the room. This might help them feel more comfortable talking with the doctor. If you have any questions about your child’s health between regular office visits, call your doctor’s office. Your doctor’s receptionist or nurse will be able to help you decide if you need to see the doctor.